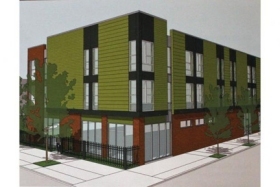 Last week, Chicago city council approved the allocation of $1 million in Tax Increment Financing (TIF) funds to the development of a new affordable housing facility in Humboldt Park. The nonprofit agency Children’s Place Association LLC is leading the project with plans to construct a three story facility at 3533 W. Chicago Ave. for families with at least one family member has a disability and a history of homelessness. With $5.1 million in financial backing, this affordable housing facility will be called “West Humboldt Place” and will include a mix of 13 studios, two and three bedroom apartments with amenities such as a community room, a computer center and off-street parking. Children’s Place plans to provide supportive services like case management, family success coaching, mental health therapy and job and education assistance to those families living in the new facility. In addition to the TIF funding, the project has also received funds from the Illinois Housing Development Authority.